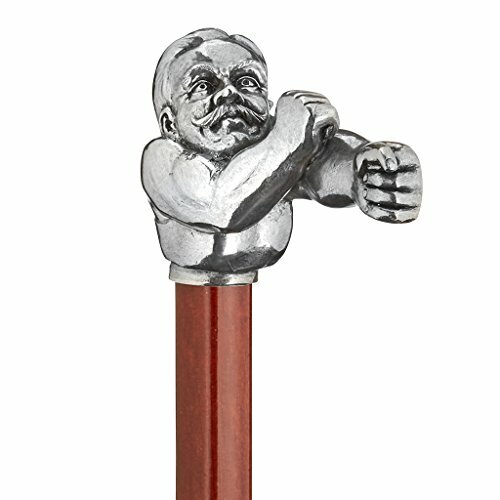 The first Heavyweight Champion of gloved boxing, John L. Sullivan, calls us to the ring with this replica walking stick inspired by the French painter-sculptor Lucien Gilbert. This unusually decorative rendition of the Boston Strong Boy raises his fists and flexes his powerful arms to form the handle of a hand crafted classic walking stick perfect for anyone who loves collecting canes or taking brisk walks in the great outdoors. This stylish Design Toscana exclusive, collectible Italian walking stick, crafted by expert artisans, features a comfortable, solid pewter grip handle, and a polished hardwood shaft which has been carefully lacquered with a clear coat to protect the wood. Expertly fitted with a rubber ferrule tip and smart pewter collar. Not recommended for orthopedic use. 33"L. 2 lbs.